Join us on another fantastic adventure when we travel through Spain from top to bottom. Our journey starts on the northern atlantic coast and we weave our way through picturesque towns and villages. We will cycle across the high plateau at over 2000 feet altitude before dropping down to Madrid. We take a well earned rest day before making our way down past Cordoba and on to our final destination Malaga where we can celebrate completing our epic journey. Day 6 - Rest day - free time to explore, celebrate, or possibly catch up on some sleep! Day 8 - Consuegra to Brazatorta - approx 130km - Across more amazing wide open Spanish plains with views into infinity - and via Ciudad Real today - one of Medieval Spains most fortified cities. 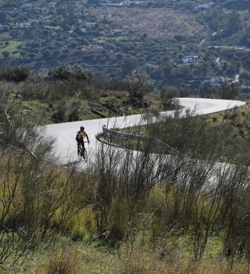 Day 10 - Castro del Rio to Malaga approx 140km - the final frontier - with one last sting as we ride over the Sierras Subbeticas, and the Torcal de Antequera - before a night to remember in the stunning city of Malaga. Accomodatiion will be mid-range 2-3 star with breakfast included - where possible we shall use village or town centre locations with access to authentic restaurants, so we can enjoy the true flavour of rural Spain. Collection available from Bilbao Airport - please confirm your flight arrival time early. Our crew expect to be arriving in Bilbao in the middle of the day. At the other end we will not be able to do transfers - as we shall be retracing 1000km back up to Bilbao ! Daily Max is expected to be around 17-19 degrees in most locations - ideal cycling weather. Although you should be prepared for either cooler or warmer, and even the possibility of rain.